Two of the most precious commodities on earth; Rare Argyle Pink Diamonds and Australian South Sea Pearls; And both call Australia home. The Australian Pink Diamonds mined from Down under though gave professionals in the Jewellery business something to really nacre about when they were first discovered in Australia; they literally turned the diamond world upside down on the table! King of Diamonds, self-educated, East End Londoner, Laurence Graff, no stranger to Diamonds was he, had never seen such a pretty diamond look so tough. Besotted the moment he caught sight of them. Graff bought up all of the first pinks from the mine. It was unheard of at the time. Far too adventurous murmered the professionals. Hard is Diamond and hard "yakka" (Aussie slang for hard-work) locating an honest pink diamond colour chart true to pink diamond colour. 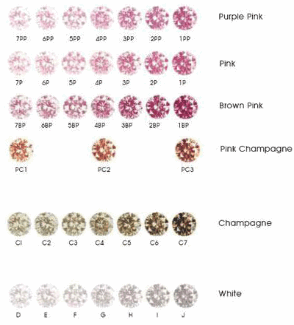 To view the pink shades that are close to the fancy pink colored diamonds, click on the link in the "Pink Diamond Color Chart" in the Jewelry Resources. Your knowledge of rare, fancy colored diamonds will only add to your appreciation and importance of pink colored diamonds that call the land down-under home! The Argyle Diamond mine in Australia had been the world's leading volume producer of diamonds since 1986, when the operation in the remote Kimberley region of Western Australia went into full swing. Diamantaire Graff bought all the first Argyle pinks, when first discovered, worth an estimated $3.5 million dollars. When Graff asked the Sultan of Brunei what he thought of the Tremblant Flower (photo at top of page) he had created with all the first pinks he had originally purchased from the Argyle mine, Graff was all out of pinks in less than 2 minutes. 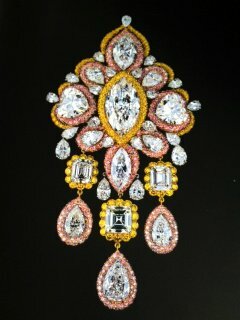 The Sultan like Graff had never seen such pretty diamonds look so tough. Among the mine's vast production is a small quantity of unrivalled intensely colored pink diamonds, from sparkling "light rose" to full bodied "purple-reds" and numbering only in the thousands of carats, thus enhancing the rarity and value. In the List of Gemstones, Australia's Pink Diamonds are believed to have been created through structural pressures exerted on carbon molecules, during diamond formation up to three billion years ago! It has to be said, that Pink diamonds have also been found in India, Brazil and Africa. However, the Australian pink diamond is recovered in a wide range of shades and polished in a wide range of sizes and shapes. The price of pink diamonds are dictated by the intensity of colour. Significant pink diamonds are sold with certification from the leading diamond grading authorities. The Australian Argyle pinks are processed in Perth, Western Australia. The work involved in the cutting and polishing, is so delicate and exacting that eventually the artisan is able to tell simply by rolling the stone in their fingers whether or not the gem is perfectly rounded. According to Gemstone Meanings & Folklore, it makes no difference if the stone is a diamond "pink" or diamond "white," a diamond equates to — "Innocence" and "Honesty". The beauty and the attraction of the Argyle pink diamonds are immediately evident and their spell is completely overpowering. It is easy to see why these types of coloured diamonds, that call Australia home, have become an object of adoration and love! Argyle pink diamonds are available only from fine jewellers.